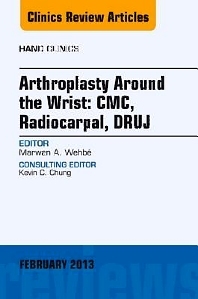 “Arthroplasty Around the Wrist,” by Marwan Wehbe, MD, will cover many of the procedures involved with wrist replacement and some techniques that don’t require implants. One article, “Thumb CMC Arthroplasty without Implants, from Anchovy to LRTI” reviews all methods to correct thumb arthritis, (anchovy is actually a rolled tendon that looks like an anchovy). Another article details a new way to fix thumb arthritis without any implants. I’ll encourage Dr. Wehbe and contributors to submit videos of procedures.